How long does grass seed last? This is probably the next most important question after finding out how long does grass take to grow. Let’s say you have plenty of seeds left after a successful planting. Now, what would you do with those? Are you just gonna throw them? You may think that it’s the simplest solution. But no! Grass seeds can last long, and maybe even longer than what you think. 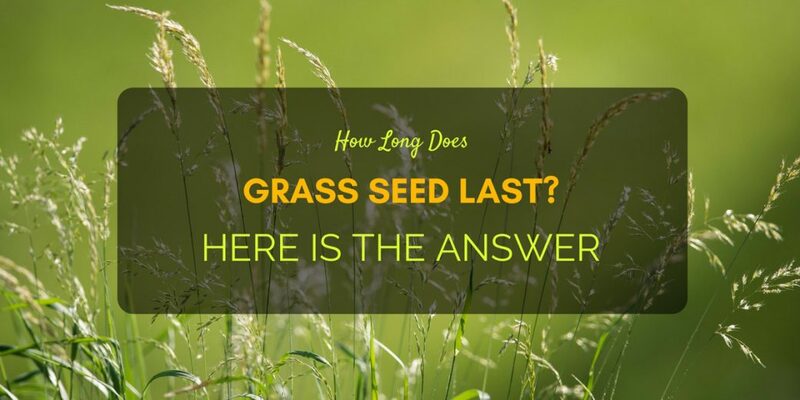 To answer the question – how long does grass seed last – it takes up years. Words of advice, however, is to use them within 2 years upon purchase. You can store those unused seeds for that long span of time. Make sure that you plant them before it expires or else you won’t see grass growing in bright green color around your yard. But why need to store grass seeds within 2 years when you can just plant them? Of course, it’s based on your own preference when and where to plant the seed. Sometimes, however, there are extras. You need to be able to reuse them later. There are times where a small fraction of the lawn gets too dried up, burned and other reasons for damage. Those are the best ways on how to reuse grass seeds, whether they’ve been opened from the bag or still unopened. How long does grass seed last when unopened? The most likely maximum duration is 5 years. If opened, that’s another story. Because the seeds have been exposed, the lifespan is reduced from months to over a year. There’s also a couple of differences between sealed and bagged seeds. Sealed grass seeds are the best option to purchase. It’s for the simple fact that each seed is protected and remains unnatural. This means there are no changes in moisture. Once exposed with air, the moist level changes, which quickly decreases, and this can affect the seed’s shelf life by producing sprouts. Since they’re out in the open, bagged seeds quickly sprout. It’s not only its lifespan is reduced but also increases the chance to dry or worse get damaged. These seeds should be stored in an airtight container as soon as possible to prevent fast sprouting or sudden damage. In addition, store at room temperature, such as in a garage or basement. You also place at any corner without direct sunlight. To prevent condensation, it’s best to use the same or original packaging. How long does grass seed last essentially relies on good natural conditions. In other words, these are dependent on dry air. There should be less moisture. That’s why it’s important to keep seeds stored properly for longevity. You must also consider the fact that grass seeds are different. There are varieties to choose from. Some seeds last longer than the other. So how long does grass seed last can also be based on their variant. Remember that there’s a need to make some practical choices even for a simple thing like this. You do not buy just any seeds. It’s important to involve some areas that can help you get the best type of seed. First of all, you need to determine if you need grass that’s ideal for warm or cool season. There are types of grass that can stand all types of season, while others can only survive one type of weather. That also indicates that you have to find out your zone. Do you live in an area where it rains a lot of times? Is your place experience a worse kind of winter? Secondly, figure out if you want high or low-maintenance lawn. 99.9% will surely go for lawn that’s easy to care and maintain, because why not? In that case, you won’t be even have an issue regarding how long does grass seed last. Another factor to determine is foot traffic. Is it light or heavy? You may also see the importance of using the lawn. Do you need it just to enhance your outdoor areas? Or are you planning it for play or sports purposes? All these are necessary aspects to take into account when choosing grass seeds. Before you buy, it’s best to determine all of them and make it your final and hopefully the best decision.